Jobu reviews the Yankees series win against the Minnesota Twins. After their big series win against Oakland over the weekend, the Yankees traveled to Minnesota for a three game set against the lowly Twins. A sweep would have been nice, but at least they managed to take two out of three and lower their magic number to six, as the Orioles lost two out of three to the Blue Jays, whom the Yankees face next. 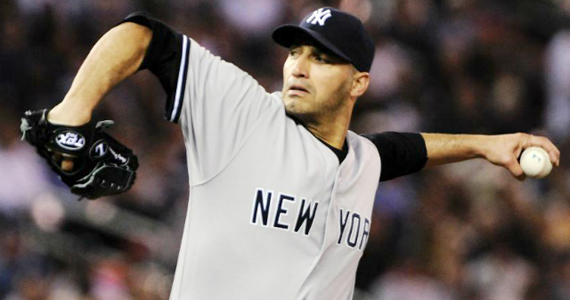 The Ageless Wonder, Andy Pettitte was on the hill for the Yankees in game one. Pettitte was making his second start since coming off the DL and facing Liam Hendricks, who came into the game with a 1-7 record. While this was a classic trap game, the Yankees hit some long balls and Pettitte was stellar again in a big 6-3 win. As good as he was in his first start off the DL (command issues not withstanding), Pettitte was even better in his second start. While he went only five innings last time, his increased pitch count (to about 85) allowed him to go six in this one. 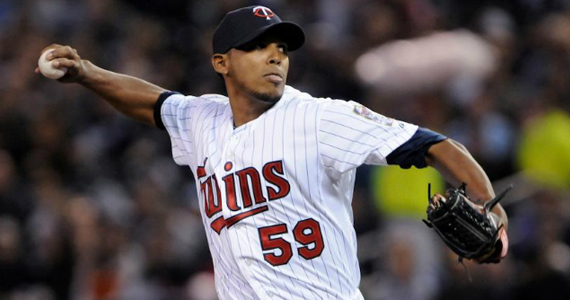 The Twins couldn’t plate any runs off the veteran, which kept his post-DL ERA at 0.00. His final line looked like this: 6 Ip, 7 H, 0 R, 1 BB, 3 K, 88 pitches and his fifth win of the season (5-3). If Pettitte truly is struggling with his command since his return, I ain’t seeing it. The Twins runs all scored off of Cory Wade and Justin Thomas (although David Robertson technically gave up the two-run triple in the ninth), but they won’t be with the team in the post season, so it’s ok. The Yankees came out swinging right away against Mr. Hendricks, and it was the long ball that got them the win in this game. Robinson Canó drove in the first run of the game with a ground out, but the rest of their runs scored on dingers. Swisher hit a two-run bombaclot with two outs in the top of the first, Granderson added his 40th home run of the year in the top of the fourth (just the fifth Yankee to do so in consecutive seasons) and Raúl Ibañez and Eric Chavez both homered in the top of the seventh. Six runs on four home runs. Now that’s Yankees baseball, right? Remember when everyone was complaining that the Twins new stadium was impossible to hit home runs in? That’s because you have to actually have guys in the lineup who can hit the ball out. This was a very frustrating game. The Yankees sent Phil Hughes to the mound against Esmerlin Vásquez, who has been so terrible that even his own announcers made fun of him (Michael Kay was told by an unnamed announcer that Vásquez wouldn’t be in the game long enough for Kay to learn the proper way to pronounce his first name). Naturally, He only allowed two runs in six innings. That’s how he rolls. Anyway, the Yankees had this game won, but Boone Logan couldn’t hold the lead, so we got a very frustrating loss. At least the Orioles lost again. Gotta feel bad for Hughes in this game. He pitched into the seventh and left only having allowed two runs, with a 3-1 lead, and all he got to show for it was a big, fat L. The culprit was Boone Logan, who came in with the bases loaded and two out to face four lefties and only got one of them out. Logan’s first pitch went under Russell Martin’s glove to make it a 3-2 game. Not much later, Denard Span doubled in two runs to give the Twins a 4-3 lead. After a walk to Ben Revere (wasn’t he on Zoobilee Zoo? ), Joe Mauer singled in another run. That would be the final score. 5-3. Hughes’ final line looked like this: 6.2 Ip, 6 H, 4 R, 1 BB, 4 Ks, 99 pitches and his thirteenth loss of the year (16-13). The Yankees had one of those frustrating games where a terrible pitcher pretty much shuts them down. It seems to happen a lot when the Yankees face a new pitcher (although they’d faced Vásquez before), and it happened in this one. There were some bright spots though. Swisher gave the Yankees a 2-0 lead in the top of the fourth with another two-run homer, and Martin expanded it to 3-1 with a solo bomb of his own in the top of the seventh. That looked like it was going to be enough, but alas… it wasn’t meant to be. Andruw Jones hit a homer in the top of the ninth to make things interesting, but the game ended 5-4. Despite the fact that they’re during my work hours, I enjoy week day day games. The Yankees finished up their series with the Twins on Wednesday afternoon, and it was a fun one too. CC Sabathia was back on the hill after shutting down the A’s in his last start, and he was facing Samuel Deduno, who wouldn’t make it past the second inning. 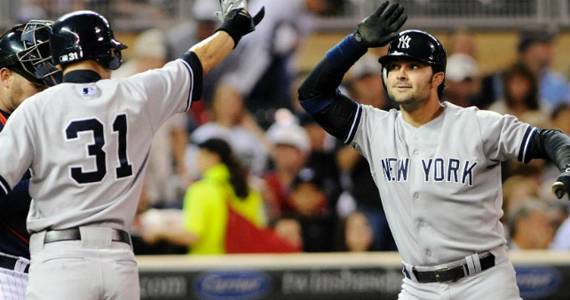 The Yankees took the game and the series, lowering their magic number to six. I’m still very skeptical every time CC pitches now, and I tend to think every leadoff single is going to lead to a four run inning. 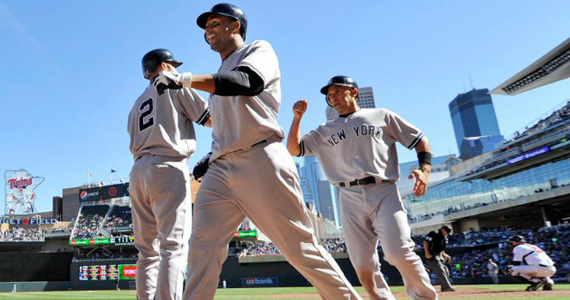 For two starts in a row now, though, CC has been nearly untouchable. He was overpowering in this game, registering double digit strike outs again and keeping the Twins down while the Yankees offense blew them out. His final line looked like this: 8 Ip, 6 H, 2 R, 1 BB, 10 Ks, 119 pitches and his fourteenth win of the season (14-6, finally!). Cody Eppley cleaned up the ninth inning, but the game was long over before that. I think I need to see one more start like this from CC before I can officially say he’s back, but it’s nice to see him doing well again. As I mentioned before, Deduno didn’t make it out of the second inning. Just 1.2 innings and 30 pitches into his day, he had to leave the game due to an irritation in his eye (what’s with everyone getting that lately?). That’s when the bullpen took over, and so did the Yankees bats. The Yankees only needed one home run to score their eight runs, but the rest were fun to watch anyway. In fact, they all came in one inning, the top of the third. After Chris Stewart grounded out to open the inning, Chris Dickerson and Ichiro singled and Derek Jeter walked to load the bases for Canó. Robbie continued his suddenly hot hitting with a two run double to right, and Swisher followed with an RBI single that scored Jeter. Curtis Granderson then tripled to right, which scored Canó and Swish. To be neat about things, reliever Brian Duensing then uncorked a wild pitch that allowed Granderson to score the sixth run of the inning. It happened very quickly, and it was a lot of fun. For good measure, Dickerson added a two run home run in the top of the sixth, which accounted for the rest of the Yankees eight runs. Whoopings are fun, aren’t they? Notable Offense: HR – Dickerson (2), RBI – Canó 2 (82), Swisher (90), Granderson 2 (97), Dickerson 2 (5), 2 hits for Ichiro, Canó, Ibañez and Dickerson, Derek Jeter went 0-4, snapping his 19 game hitting streak.